When the development of a system has started and requirements change there will be an impact of the change and the effect will need to be determined, understood and managed. Having traceabilty established both to up-process elements such as Stakeholders and Business Drivers and down-process elements such as Use Cases, Components, Test Cases and source code operations is critical to determining the impact of the change. Enterprise Architect has a number of facilities that can assist with this including the ability to visualize traces in diagrams, a powerful Relationship Matrix, a Traceability window, element Change, Task and Effort items that can be used to record impact and what is required to implement it. The ability to visualize requirements and the way they are connected to other elements is a powerful tool for analyzing the impact of change. Requirements often form a hierarchy and when one requirement is affected it typically has a ripple effect to the requirement's children and being able to visualize this in a diagram or in a hierarch is very useful. Requirements are also typically traced to up-process and down process elements and a diagram provides a way of viewing and analyzing these connections. The Insert Related Elements function can discover these connections and automatically draw and layout a diagram allowing the modeler to spend their time analyzing the impact. 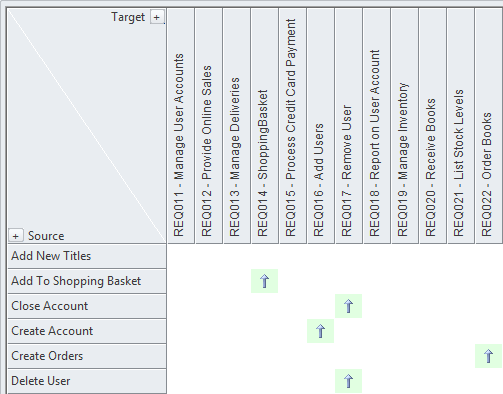 The Relationship Matrix can be used to visualize the requirements and their connections by placing the Requirement on one axis of the matrix and the connected elements on the other. This method is very useful in workshops when working with people who might not be familiar with modeling languages like UML or who work better with spread sheet types of views. Any number of matrices can be created and their specification can be stored so they can easily be recalled. 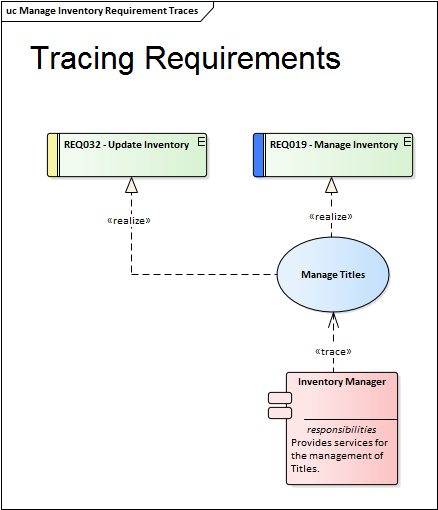 The Traceability window is a powerful window that shows the hierarchy of elements in the Repository. It is particularly useful because it unconditionally shows how elements are related to each other. 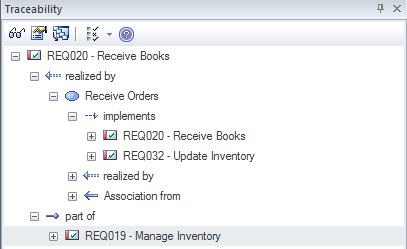 Other views of the repository could be configured just to display particular elements for the purpose of communicating an idea whereas the Traceability window will display all relationship that an element participates in which makes it particularly useful for analyzing the impact of change.